Paris St Germain have picked up 25 points from their opening nine Ligue 1 matches. Thomas Meunier scored twice, including an injury-time winner, as Ligue 1 leaders Paris St-Germain won at Dijon. 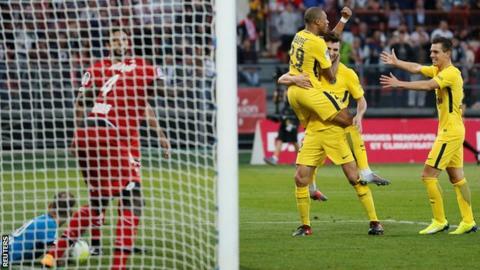 PSG hit the crossbar twice through Dani Alves and Marquinhos efforts before Meunier put them ahead with a rebound after Neymar's shot had been saved. Dijon, who have only won one Ligue 1 match this season, equalised with a 30-yard volley from Benjamin Jeannot. But PSG scored the winner in the second minute of added time when Meunier scored from Kylian Mbappe's pull-back. PSG, who won the Ligue 1 title in four successive seasons before finishing second to Monaco in 2016-17, have only dropped two points from their first nine league matches of the campaign. The club are also still unbeaten in their 12 matches in all competitions in 2017-18 and six points clear of Monaco, who lost 3-2 at Lyon on Friday. In August, PSG paid a world record 222m euros (£198m) to sign Neymar from Barcelona and signed Mbappe on a season-long loan from Monaco with an option to make the deal permanent for 180m euros (£165.7m). Match ends, Dijon 1, Paris Saint Germain 2. Second Half ends, Dijon 1, Paris Saint Germain 2. Goal! Dijon 1, Paris Saint Germain 2. Thomas Meunier (Paris Saint Germain) right footed shot from the right side of the box to the bottom right corner. Assisted by Kylian Mbappe. Attempt missed. Neymar (Paris Saint Germain) right footed shot from the centre of the box is too high. Assisted by Dani Alves. Attempt saved. Xeka (Dijon) right footed shot from the centre of the box is saved in the top centre of the goal. Assisted by Valentin Rosier with a cross. Florent Balmont (Dijon) wins a free kick on the right wing. Benjamin Jeannot (Dijon) is shown the yellow card for excessive celebration. Goal! Dijon 1, Paris Saint Germain 1. Benjamin Jeannot (Dijon) left footed shot from outside the box to the high centre of the goal. Attempt saved. Neymar (Paris Saint Germain) right footed shot from outside the box is saved in the bottom right corner. Offside, Paris Saint Germain. Neymar tries a through ball, but Lucas Moura is caught offside. Corner, Paris Saint Germain. Conceded by Valentin Rosier. Substitution, Paris Saint Germain. Lucas Moura replaces Ángel Di María. Attempt blocked. Xeka (Dijon) right footed shot from outside the box is blocked. Xeka (Dijon) wins a free kick in the attacking half. Substitution, Dijon. Frederic Sammaritano replaces Kwon Chang-Hoon. Substitution, Paris Saint Germain. Giovani Lo Celso replaces Julian Draxler. Substitution, Dijon. Wesley Said replaces Naim Sliti. Goal! Dijon 0, Paris Saint Germain 1. Thomas Meunier (Paris Saint Germain) right footed shot from the right side of the box to the bottom right corner. Attempt saved. Neymar (Paris Saint Germain) right footed shot from the centre of the box is saved in the bottom right corner. Assisted by Julian Draxler.